As we turn the calendar page into 2018, one thing can be certain about 2017; it was the year of cryptocurrencies. Just 6 months ago, most of us had never even heard of bitcoin or any of the other cryptocurrencies currently flooding cryptocurrency exchanges. Now you can’t turn around without seeing something about this new phenomenon. Questions abound: How does it work? What does it all mean for the future? What is blockchain? Should you be investing in it? If so, how? Should we be recommending it? Is it just a passing fad? It would take way too long to address each of these questions, and I’ll leave the technical aspect of the industry to the professionals. Most of those questions can be addressed fairly quickly with google searches. Regardless of whether you understand much about cryptocurrencies and blockchain, if you are like most investors, you are wondering if this is something that you need to be seriously exploring and considering. Before we get into investment recommendations, let’s look at where it has come and gone in just the past several months. At the beginning of 2017, there were several hundred different cryptocurrencies with an overall aggregate market cap, which is the total investment value of all related currencies, of $17.7 billion. In just the past year, that has grown to 1,385 currencies currently being traded on cryptocurrency exchanges with an aggregate market cap of over $715 billion. That is impressive growth. 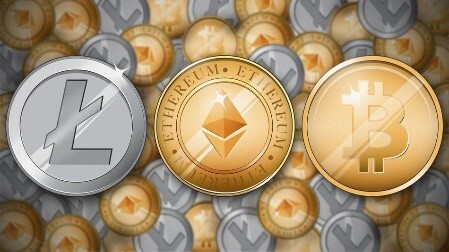 There is much debate about the viability of this market, but after spending a good amount of time researching cryptocurrencies and blockchain over the past several months, my conclusion is that the cryptocurrency market has the potential of being a transforming industry that will eventually change how transactions take place and are accounted for in the future. The impact of this technology will likely be similar to how the internet transformed commerce and communication. During the late 90s, the dot coms were all the rage. All a retail company had to do was mention they were moving to an online presence and incorporating a dot com functionality and their stock immediately exploded higher. Aspiring entrepreneurs were quickly finding the road to riches – identify a retail market, come up with a one page business plan, secure a catchy website and watch the investment dollars come flying in via private or public markets. Tech stocks that had anything to do with this promising new e-commerce technology went through the roof. Dot com millionaires were being made overnight. If you were an active investor back then, the feelings were quite similar to today. The fear of missing out (FOMO) was ever present. There was no doubt this was revolutionary; you had to get on board some way. Dot coms, ISPs, social medias, fiber optics – it was the undeniable future. Investors invested at all cost. They disregarded basic investment fundamentals. 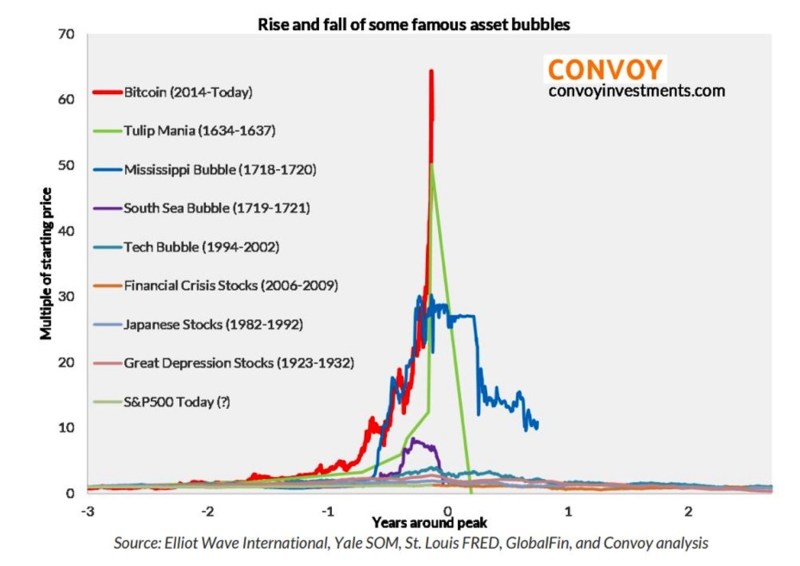 They shunned any mention of what speculative bubbles look like. Yes, the internet was the future, but valuations in the end matter; profitability in the end matters; a settling of a transforming technology was inevitable; growing pains were unavoidable. Eventually, by early 2000, the NASDAQ (the index that represents tech stocks) bubble popped, and a bear market began that eventually saw the index decrease by more than 80%. Dot coms were going out of business in droves. Did this mean that the internet was dead or wasn’t the transforming technological advance that we thought? By no means. As we all know now, it has truly been transforming, but the speculative advance got way ahead of itself. People were throwing money at a technology they did not really understand, and a massive bubble ensued. Once there was a settling of the markets and industry and a washout of the pretenders, we were left with an industry we understood more and leaders that were defining how the future would look while establishing their dominant positions. It is amazing how similar the cryptocurrency craze is to the internet/dot com craze. Now, when a company mentions it is exploring blockchain functionality or cryptocurrency involvement, its stock immediately jolts higher, no questions asked. Launch a new cryptocurrency directly, and you have an immediate market cap in the mega millions instantly, no questions asked. 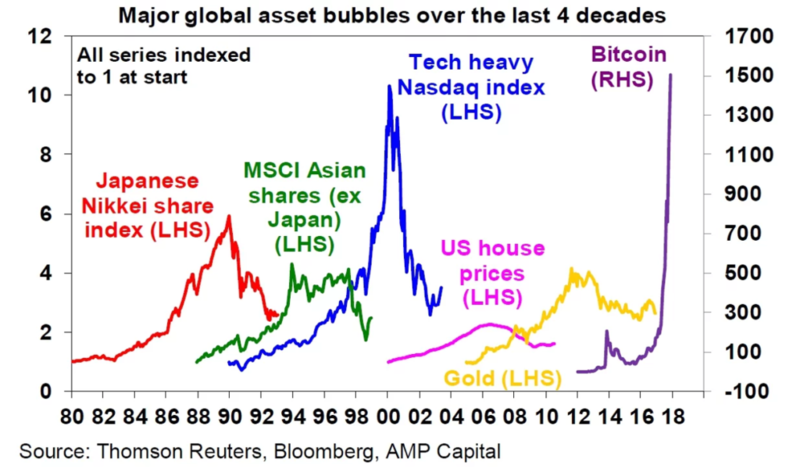 When looking at the second chart, it appears that bitcoin has only just surpassed the appreciation multiple of the NASDAQ bubble. However, the bitcoin gets its own multiples scale on the right, which shows a multiple appreciation of 1500 vs. 10 for the NASDAQ. Of course, NASDAQ stocks began its build up from a much larger base of established companies than bitcoin, which started from basically nothing. I suspect if a chart existed that showed internet/dot com stocks only, it would look similar to that of bitcoin. All of these bubbles have two things in common. 1) At or near the tops, speculative investors were not investing in these assets for their intrinsic value; they were investing in them because they were confident they could sell them at will to other investors at higher prices. 2) They all eventually and spectacularly came crashing down. After the inevitable crash, our advice to investors is…DO INVEST; as long as nothing has changed to indicate it is not the transforming technology that we think it is. When the dust settles, and the cryptocurrency industry becomes more clearly defined, strategically invest in the currencies that will likely be the future of the industry and companies that enable the blockchain technology that underpins the infrastructure. Bitcoin was the first and most recognizable cryptocurrency since its launch in 2008. As a result, many believe that it will be the best and safest investment in this space. History suggests otherwise. In every instance, you would have been better off waiting, in most cases several years, for the various technology bubbles to settle and watching for the eventual market leaders to emerge. Of course, pinning down which companies or currencies will be the future market leaders is a challenge. If you are wanting to try to pin down the eventual cryptocurrency leaders, we would strongly suggest waiting for the inevitable bubble to pop and picking a handful of emerging currencies or tech companies in that space that appear best positioned. Until then, watch and wait and appreciate a front row seat to the biggest investment bubble mankind has ever seen. Contact us for a complimentary portfolio and retirement assessment. As fiduciaries, our commitment is first and foremost to our clients and their financial future. Our fee-only structure creates a common goal between you and your advisor. We employ an investment methodology and strategies that are proven to consistently grow your portfolios in both bull and bear markets. As an independent firm, we have access to unlimited investment options and provide you with unbiased advice. © Copyright 2017 Navigo Wealth Management. All rights reserved.